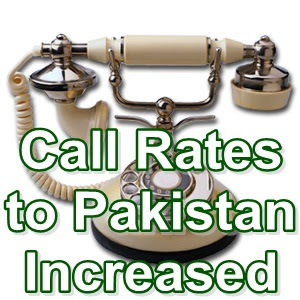 Call rates to Pakistan from all other countries has been increased from 300 to 800 percent due to implementation of ICH (International Clearing House) Charges. Increase in call rate, which is about 300 percent to 800 percent, varies due to country of caller and his network. Call rates has been increased since 01 October, 2012. This decision was made by Pakistan Telecommunication Authority and backed by Ministry of Information Technology. Online calling companies like Skype has also increased its call rate for Pakistan. Standard call rate from anywhere to Pakistan through Skype is now 14.5cents/min. According to government officials, ICH has been adopted to eliminate gray or illegal call traffic to Pakistan. ICH (International Clearing House) will streamline all the incoming international calls through PTCL maintained Central Gateway and all LDI Operators will share revenue based on their market share. Monthly inbound call volume to Pakistan is about 1.5 billion minutes. According to Critics and Analysts, government will collect an additional 120 to 150 million US Dollars per month through increased call rates. According to reports, CCP (Competition Commission of Pakistan) has challenged the PTA's decision of ICH. CCP has issued a policy note to PTA and Ministry of Information Technology. In this note, CCP said that implementation of ICH is illegal and not competitive in nature as it will create monopoly of PTCL while LDI operators will get revenue share based on their quota and their market share so LDI Operators will not struggle to increase their international sales of incoming calls. This new policy of increased call rates will mainly effect overseas Pakistanis who are economic backbone of Pakistan. Overseas Pakistanis sent foreign exchange worth billions of dollars each year. Mostly these are working middle class who are living abroad to work for their family and ultimately their homeland, Pakistan. Increased call rates has dis-hearted them as now they can make only short duration calls to their family in Pakistan. When traditional calls to land line and mobile phones has become costly, overseas Pakistanis are in search of other alternates through which they can make cheap calls to Pakistan. There are many online companies / websites which offers almost free Internet to Internet Calls to anywhere in the world. Many educated overseas Pakistanis are already using this latest calling facility. This is a very good option as both parties not only make voice calls but also video calls. They only needs computer or smartphones with internet facility, a headphone, a PC Camera and an account of any service provider. We will soon provide complete procedures of making free or cheap calls to Pakistan on PakistanHotline.com. Click to See "How to Make Free Skype to Skype Calls to Pakistan"
The best way to call cheap and anytime is through skype to skype over the cell phones/laptop/desktop. Well, what I am thinking is to get a phone that run skype nicely on cell phone in Pakistan and use Zong's monthly package of Rs. 200/- unlimited data (2GB).iN GENERAL sKYPE AUDIO CALL USES 3MB / Min. so that will give 666 min per month. This should be good enough. Problem with Pakistan is that they dont have 3G yet.Otherwise we can go for video option as well. Most older generation UK based Pakistani's do not use PC's or the Internet. They are the ones most likely to calling their families in Pakistan. Majority of Pakistani's, especially outside main towns and cities, do not have PC's or access to the Internet. Thus the proportion of calls made Internet to Internet is very small in comparison to the total volume of calls/minutes made. I had been using a calling card for a while now, I was paying around 3 cents/min. The website now says their rates have gone up to 15 cents/min. I seriously cannot believe this, many services are offering free calls to India and look at our country. I may have to try Google as the rate is 10 cents/min for mobile. We probably all thought we are safe from the corruption in our country but our evil genius politicians found a way to loot the overseas Pakistanis. I just checked Nettalk also updated their rates to 10c/min and around 12 c/min to mobile. Zardari & rehman Malik world's superior bastered .........they Are making money ........no any other reason .. THE HUMBLE REQUEST TO ALL MEDIA, PLEASE DO YOUR EFFORTS/DEBATE. Please don't vote to those having dual nationality, foreign residency, foreign assets, foreign Bank Account/s and/or any Industry/Mills etc. 100% assures that if the following are done, we come-out from present situation Inshallah. 1. A-Z Government’s officials from top to bottom prohibited to keep Account/assets in foreign countries. Those having must transfer Into Pakistan, otherwise resign. 2. A-Z Government’s officials from top to bottom prohibited to establish Any Industry and/or trade otherwise resign. 3. No one can take part in Election, who having dual nationality, Assets and/or Bank Account/s etc out side of Pakistan. 4. An undertaking from each participant in Election, None having as stated in no.3,if so than all national and foreign assets will be taken by Pakistan Government and no case will be lodged. 5. Pakistan Visa must be same requirements/condition and even fee same as the Applicant’s country. 6. Prohibited land/property to be sold other than Pakistan Nationals. 7. 1-Province to makes unity for all languages (Pakistanis) instead of 4-provinces.